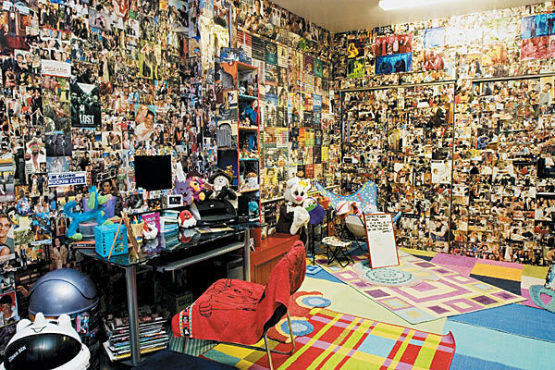 A Bronx native collages her apartment with pics of her fave celebs. Talent-agency assistant and TONY reader Lori Mooney recently contacted us, writing that she's "26 years old, obsessive compulsive, creative and completely enamored with cutting pictures out of magazines and putting them on my walls." When we saw the vertigo-inducing photos of her Morris Park two-bedroom apartment that accompanied her letter, we knew we had to share her artful fetish with the rest of NYC and pay her a visit. According to Mooney, a self-proclaimed colorphile, she's been plastering her surroundings with magazine pics since she was 16, starting with teen title Big Bopper, and graduating to People and Us Weekly. Before moving into her current home, she spent two months meticulously covering her walls and blinds ("it took six hours for each set") with photos of Rosie O'Donnell, Drew Barrymore, Patrick Dempsey, Michael Jackson and the cast of Lost before moving in. "When the white glares out [from the walls], it freaks me out," she explains. And though her abode looks decoupaged, Mooney's process for banishing blank decor is quite forgiving and entirely removable—unlike the French craft, which uses glue to cement images onto objects. Since she's a renter, Mooney uses a puttylike poster adhesive called Fun-Tak ($2.50 at joann.com) to affix her latest Hollywood fascinations to her walls and furniture, including her litter box. "It's an ongoing process," laughs Mooney. "I'll do a few things here and there. Every two weeks, I take pictures so I can see imperfections," she says. "My roommate gets dizzy in here after half an hour. But white is horrible, white is bad." Currently, there are more than 10,000 magazine cut-outs on display in her joint, with the exception of Mooney's heater, which she painted red. "You can't put glue or Fun-Tak on it, which annoys me."